Bismarck Veteran’s Memorial Public Library is Bismarck’s current municipal library. It opened in 1963 to replace Bismarck’s Carnegie Library, which opened in 1918. Marshall Jewell and C.M. Dahl initiated the first effort to establish a Bismarck public library in 1893. Other efforts, including one led by Governor Hanna in 1901, also failed. Plans for Bismarck’s first public library progressed in 1915 upon re-organizing the commercial club. 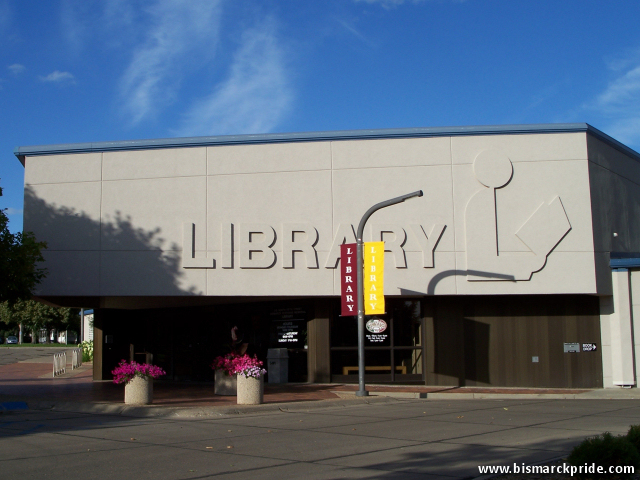 At the time, Bismarck was North Dakota’s only city with more than 3,000 residents that didn’t have a public library. Prior to that, the public’s only access to free books was at the commission’s collection at the Capitol. Upon re-formation, one of its first acts was to appoint a library committee, who immediately corresponded with the Carnegie Foundation. A temporary city library consisting of 2,000 books, mostly community-contributed, was established in the Commercial club and formally dedicated on February 22, 1916. Original response from the Foundation was discouraging. The funding offered was considered inadequate, due in part to the Foundation’s perception that Bismarck was a small town. It took convincing the Foundation that Bismarck was larger, and more important, than its footprint and population suggested. Finally, the Foundation approved $25,000 for a public library in Bismarck. As a condition for receiving the grant, Bismarck was to furnish a site and financially support the library as a cost of no less than $2,500 per year. Residents overwhelmingly approved the appropriations in spring 1916. The library would stand on Thayer Avenue across from the Burleigh County Courthouse and next to the city hall. Construction completed at the end of 1917, the existing library’s contents were transferred on January 5, 1918, and the library was formally dedicated on February 22, 1918 – the 2nd anniversary of the public library’s formal inception. The current library at 5th Street & Avenue A – Veteran’s Memorial Public Library – opened on July 8, 1963, replacing Carnegie Library (demolished in 1980). It was originally constructed for $375,000. Its largest expansion and renovation concluded in 1989 at a cost of roughly $3.9 million. $3.5 million was financed, controversially, through the city’s $17 million sale/lease plan that also included a Civic Center expansion. The plan included a 1% sales tax increase, which was approved in 1986. When completed, the project added 50,000 square feet and renovated the original 18,000-square-foot building. The expansion opened in summer 1988, at which point renovation commenced for the existing building. Funding excluded new furnishings or a completed basement meetings rooms. At the time of the renovation, the library housed 130,000 volumes. The expansion could hold 250,000. Several minor renovations have followed, including in 2009 to the Children’s Library.